Marshall amps amplify the world’s greatest musicians. And now, they’re even amplifying Alexa. It’s time to make your smart home rock and roll. The thing about smart speakers is that some of them don’t exactly sound brilliant. Where’s the bass? Where’s the precision? Where’s the POWER? That’s what Marshall Voice speakers deliver. They’re smart, for sure. But they were built to rock. Marshall is famous for its legacy of loud, and Marshall Voice speakers are quite simply the world’s greatest sounding smart speakers. Where some manufacturers chuck some cheap drivers into a tin, Marshall brings its 50 years of musical expertise to every Marshall speaker to deliver explosive sound from every source. Forget titchy tweeters and muddled bass. Marshall Voice speakers pack twin class D amplifiers behind their tweeters and have a third, even more powerful amp to drive their mighty subwoofers. Their wooden cabinets deliver the warm, natural tone that’s made Marshall amplifiers world famous, and their specially designed bass reflex system increases low-frequency efficiency to maximise that low-end punch. Together it means incredibly clear, incredibly powerful sound no matter what kind of music you’re listening to. And you’ll be listening to a lot of music. With Alexa built-in you’ve got instant access to the world’s favourite streaming music services, and you can also connect audio sources via Wi-Fi, Bluetooth, RCA (on the Stanmore II Voice) or the 3.5mm input. Marshall Voice speakers are smart, too. Far-field voice recognition means you never have to lift a finger. You can control all of your music with Alexa: whether it’s pausing playback or picking up a podcast, creating a playlist or finding out what the bass player’s called, you can do it all by simply speaking to Alexa. And because Marshall Voice has far-field voice recognition, Alexa will still hear you when you’re blasting your favourite tunes. Alexa does all the heavy lifting for you. Can’t remember the words to a song? Sing the lyrics and Alexa will find it for you. Want to know when your favourite band is touring? Alexa can tell you that too, and remind you when tickets go on sale. You can even use Alexa to tune your guitar, or to kill the lights at the end of another epic day. Just as there’s a Marshall amp for every guitar, there’s a Marshall Voice speaker that’s just for you. There’s the super compact Acton II Voice with Alexa, which delivers incredible sound from a deceptively small package. And there’s the mighty Stanmore II Voice with Alexa, its twin 15-watt amps driving the speakers while a third, massive, 50-watt amp delivers incredible bass. Both models feature all the classic Marshall trademarks: the inimitable Marshall design, the legendary Marshall logo and most importantly of all, that room-shaking Marshall sound. Every Marshall Voice speaker is a spectacular solo performer – and you’ll soon be able to combine multiple Marshalls to create a truly amazing multi-room system, all controllable with Alexa and with the Marshall app. You can start with one Marshall Voice and add to it over time, or you can add it to your existing Alexa ecosystem to bring that legendary Marshall sound to the system you already have. 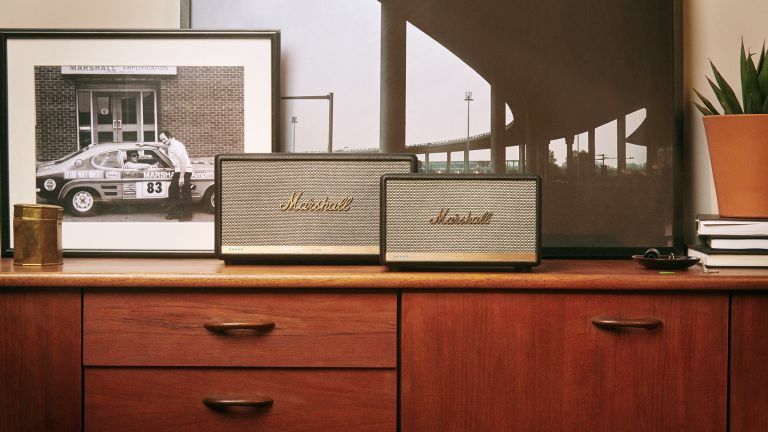 Whether it’s rock or rap, EDM or acoustic, Marshall Voice brings a live legend into any room. To find out more visit Marshall's site.